The U.S. Army is wrapping up a six week testing of three major smartphone OSs: Windows Phone, Android and the iPhone, with hundreds of devices and even some tablets. Evidently no BlackBerry or WebOS love. The point is for the Army to "anoint" two OSs approval for usage by soldiers who are deployed or just currently in service. They won't support more in order to keep development costs down as the Army is set to have their own app store for soldiers. In addition, the Army hopes that the variety will help ward off cyber-attacks as well as giving soldiers ample choice for personal preference. Of course, deployment into the battlefield may take some time as no platform currently has encrypted transmissions, but that is something the military hopes to overcome later in the year. "One popular phone from Samsung Electronics failed to connect to cellular networks and had bugs in its Android operating system, McCarthy said. So Sprint Nextel exchanged it for a different Samsung model, he said"
However, Android and iOS were "well received" so it remains to see how Windows Phone stacks up and if it makes the cut. 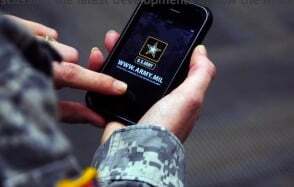 If Windows Phone does make it into Army hands, it will be a solid boost for the fledgling OS and a vote of confidence by a pretty well known organization. We'd like to think the iPhone and WP7 make the cut while Android, due to its fragmentation, Market security vulnerabilities, poor battery life and app crashing will keep it out of the final choice. We'll keep you posted.